Changelog is at end of part 3.
which I found fascinating. 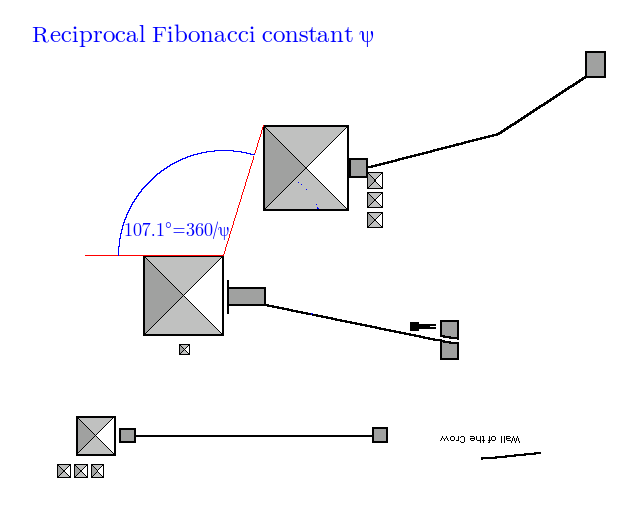 In particular (for the purposes of this post), the strange curved line at the bottom, which has been shown to be the arc of a circle after it has been divided in the golden ratio phi φ, 1.6180339887…, which for our purposes we will use 1.618 and the inverse, 0.618 as being close enough for practical purposes. When we divide a circle in the golden ratio, we get two arcs. 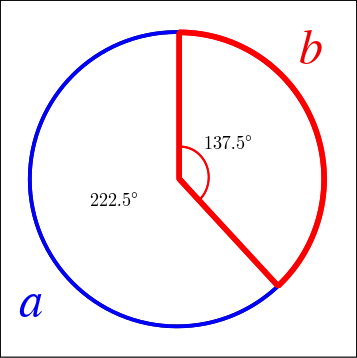 The red arc b corresponds to the golden arc on the disk. When I saw that I was reminded of the “kink” in the alignment of the pyramids at Giza, and wondered if that angle could explain the kink. 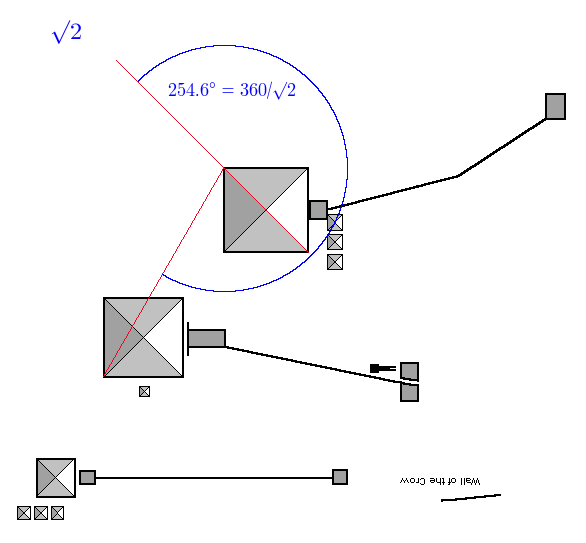 I originally started with paper, pencil and protractor, but that soon proved too inaccurate, so I switched to using a program with precise relative co-ordinates from Glen Dash’s precise measurements. I am aware of falling into the “Beautiful Mind” trap and finding patterns which happen to be there but were not put there by design. 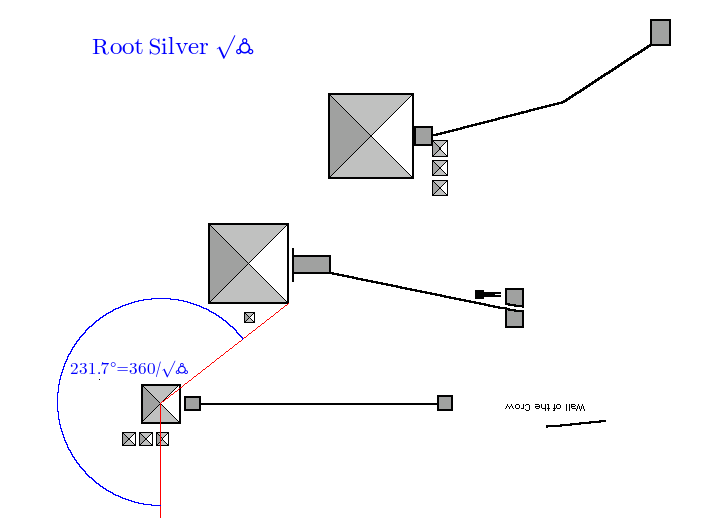 Working with 5 points on each pyramid, and 3 pyramids, can produce a lot of potential angles, so maybe you could find anything you were looking for. 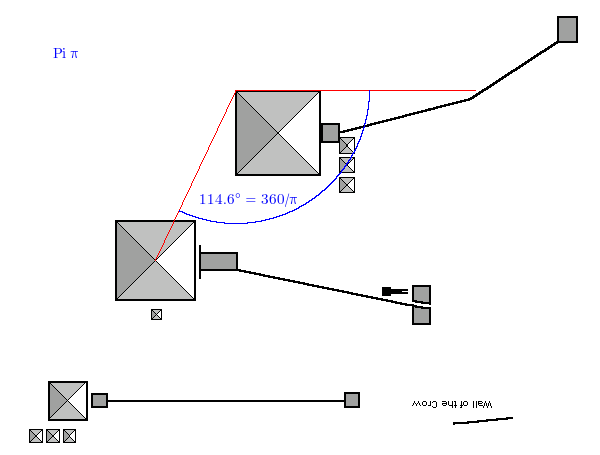 My reply to that is that the angles are relatively “simple”, i.e. 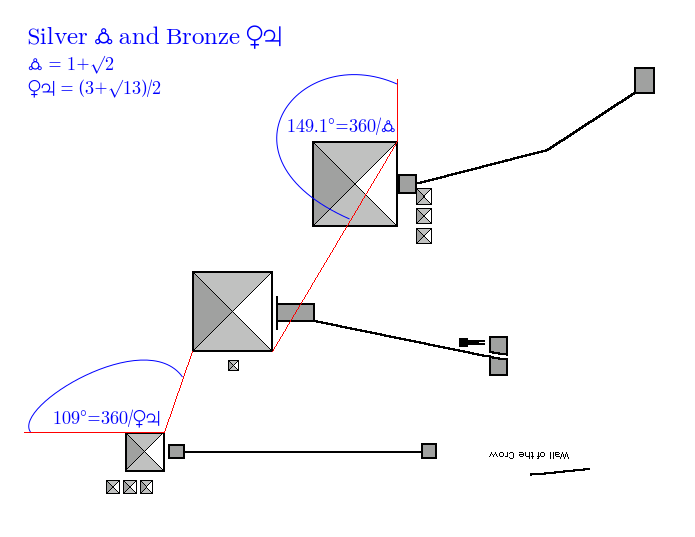 generally “basic” alignments, and the angles required are based on irrational numbers … we’re not talking about 30, 45 and 60 degree angles but something much more “unusual”. And it’s curious when the fractions of the degree seem to line up…. As Robert Bauval likes to remind us, perfection does not exist, especially when it comes to building, and even more so with something on the scale of Giza. We also have no idea how accurate their instruments were. So “a bit of slack” would not be out of line, but the results are generally pretty accurate. Also, some points were used in more than one of the following ratios, which may mean picking “best fit” for several, rather than 1 perfect and the others way off. I did this in The Gimp, which is pixel-based, so the diagonal lines are jagged. 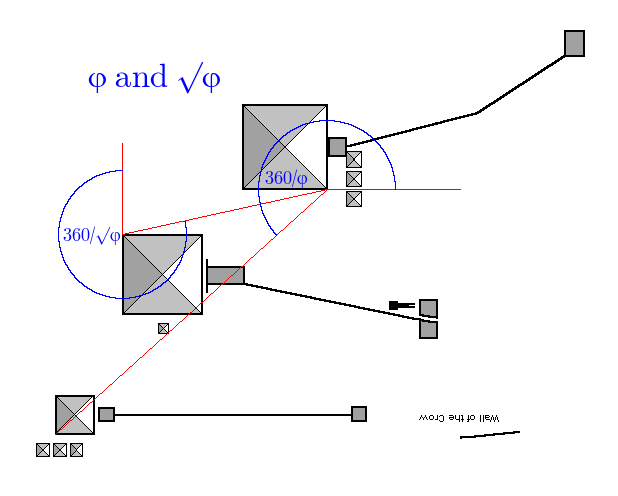 In general, I was calculating angles based on 360/x where x is some irrational. In some cases I used 360x to get a number smaller than 360. 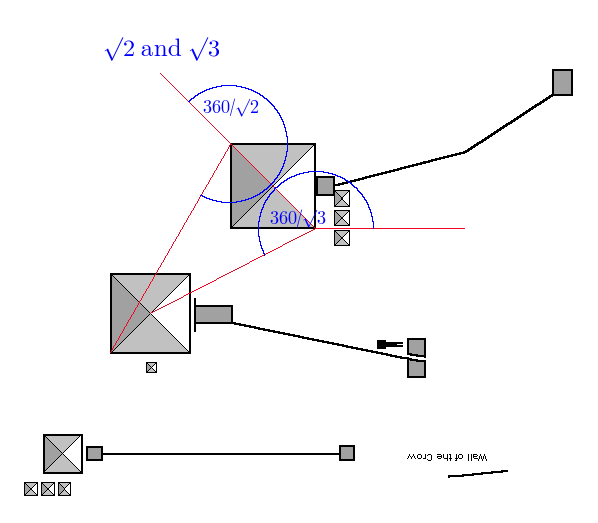 I used the differences between two points, applied the atan function to get an angle, and then adjusted it with 90/180/360/whatever to get the correct angle-baseline measurement. 1. 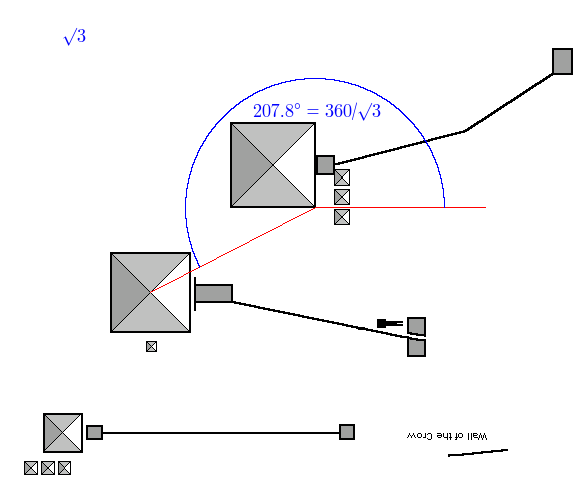 Measure every possible angle, then go and look for something that correlates to it. 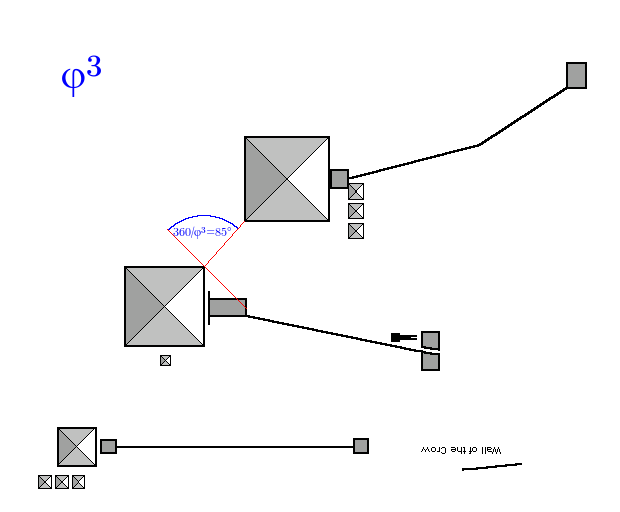 This is the sort of process that will have people measuring the diagonal of a wall in the Queen’s Chamber using Pyramid Inches, then claiming that it correlates to the average distance between Pluto and Uranus, thus “proving” that the ancient Egyptians knew about those planets and their orbits. 2. The other way is to think about what number and ratios are important mathematically, and then see if they are to be found in the layout. This is the approach I followed. I’m not claiming that the fact that there are in some cases very good matches (e.g. for φ or √7) proves anything, but the sheer number of well-known and important numbers should give one pause for thought. Achieving so many on such a limited design (three pyramids) (as well as the beautiful symmetry for some ratios) takes some doing…. 3. 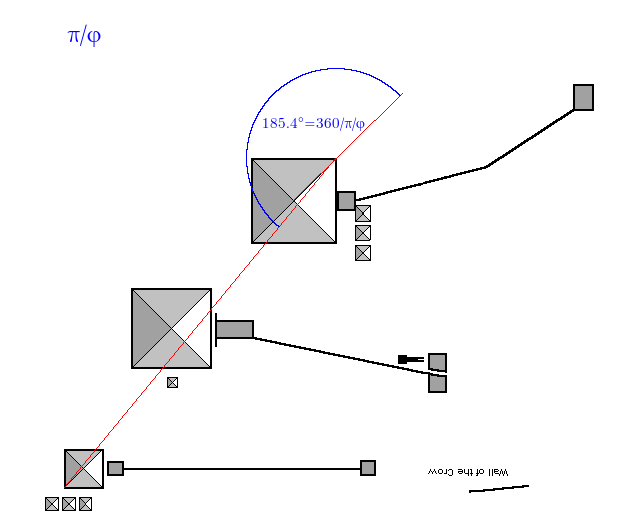 After much thought (see changelog) I decided to retain the current methodology of measuring the angles with respect to N-S and E-W (i.e. 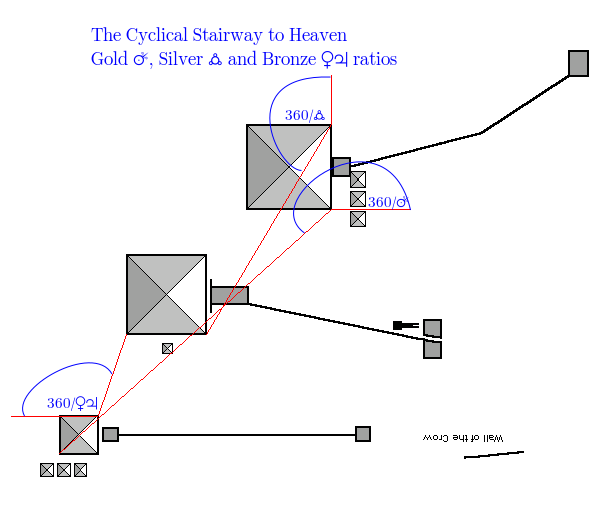 the Cartesian plane) rather than “along the edge of the pyramid”, and adjusting for the skewness of the pyramids themselves. 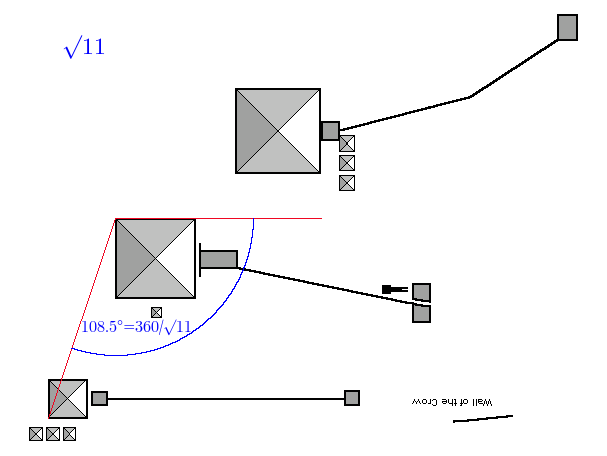 This is partly because most measurements can be made in both directions, so which pyramid skewness do I use to adjust with? I will leave the debate about this to others with more knowledge. 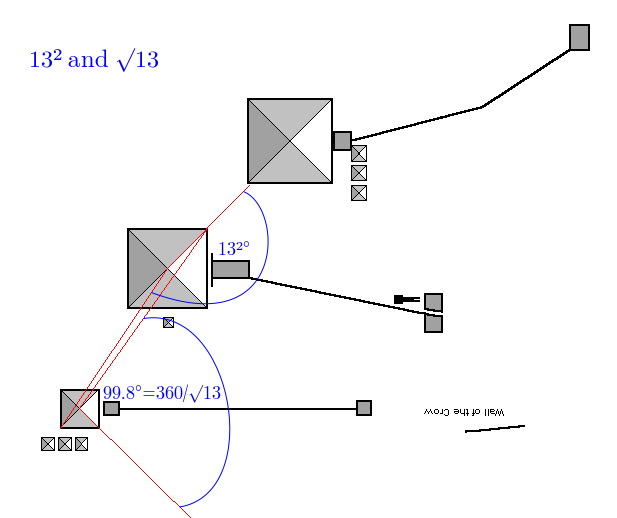 The only exceptions were for those angles measured with a baseline on the diagonal of a pyramid, in which case used the actual angle rather than 45°, they are very close to 45° anyway. Okay, with that out of the way, let’s let the pictures do the talking. 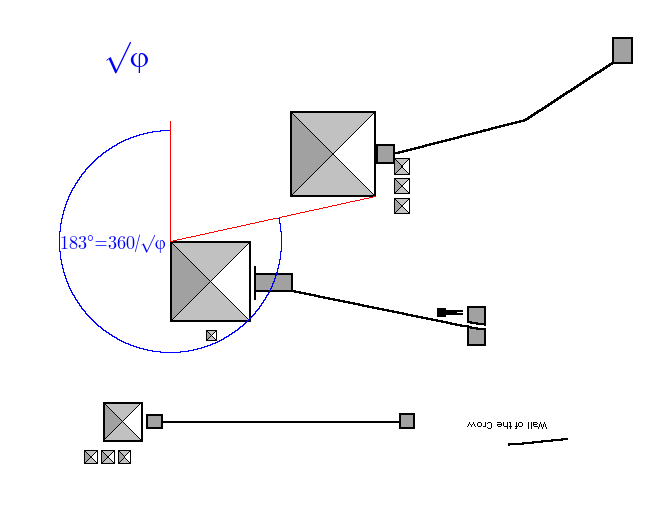 The diagrams are meant to illustrate the angles involved rather than be pin-point accurate in the measurement. 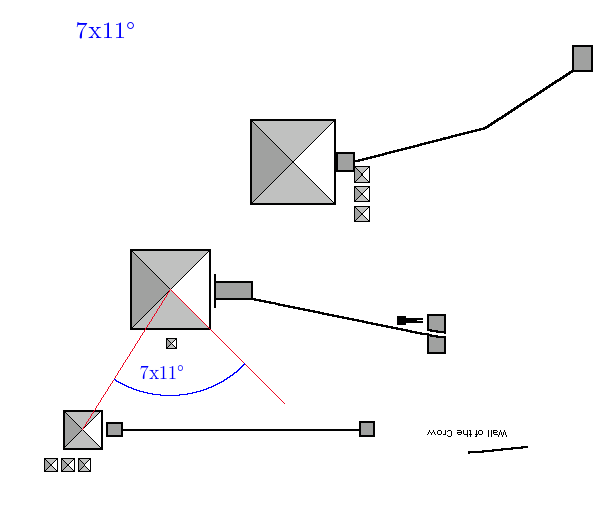 Exact numbers are given below each diagram. 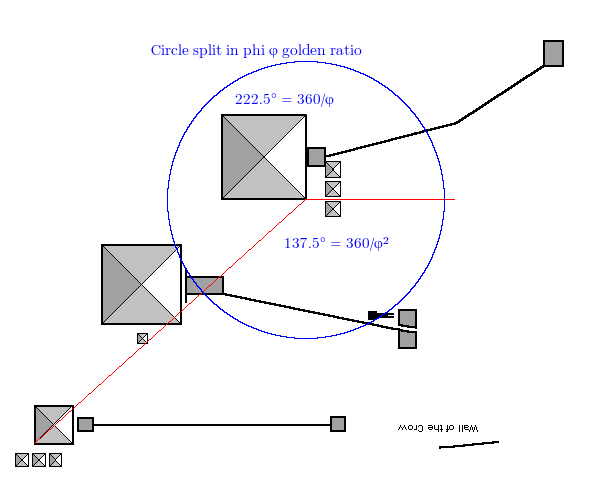 Phi circle in Giza design. The accuracy is clearly the same as for φ. Apparently φ³ was also important to the ancient Egyptians (regret have lost link where I saw that), and here it is. The problem is that angles close to 90° are tricky to find. I could originate them both from P1 Bottom Right but the drawing will be a bit messy. Staying with circle ratios, there is a school of thought that contends that a better “natural” circle ratio is circumference/radius, named tau τ, which is equal to 2π, (6.2831…). You can read more on The Tau Manifesto. 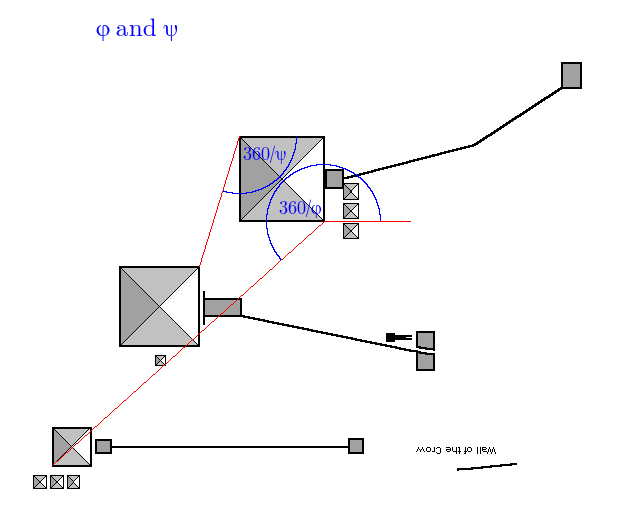 I suggest that, given it is π, φ and τ that we are talking about, and the connections between the three pyramids above, that it would be difficult to argue that this is a random fluke. So if it is not a co-incidence, then it must be by design…. 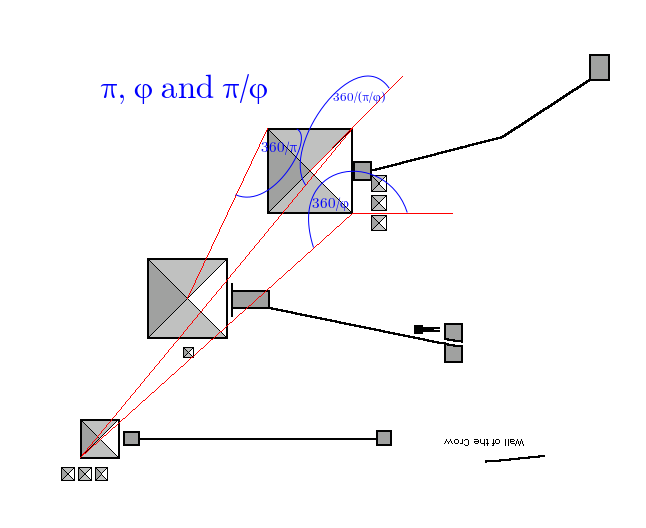 And then there’s π/φ … which provides the answer to “what is the angle joining the top right to the bottom left” …. For what it’s worth, the Euler–Mascheroni constant γ is 0.57721566490…. which, when multiplied by 360, gives a value of 207.7976393 which is very close to the angle above. There is evidence that the numbers 7 and 11 were important to the pyramid builders. For example, the height:side ratio of the great pyramid is 7:11. This may be a consequence of the building tools used, which include rods and ropes in lengths of 7 and 11 cubits. Here’s a summary of all the results on this page, arranged from best to worst, in terms of degree error. 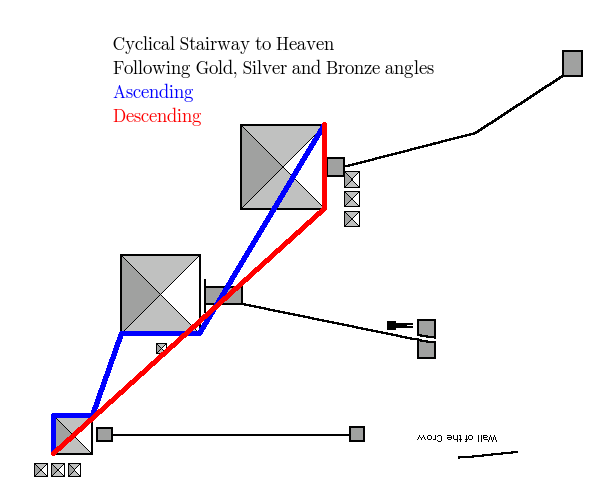 This entry was posted in Curious alignments, Giza by iandoug. Bookmark the permalink. 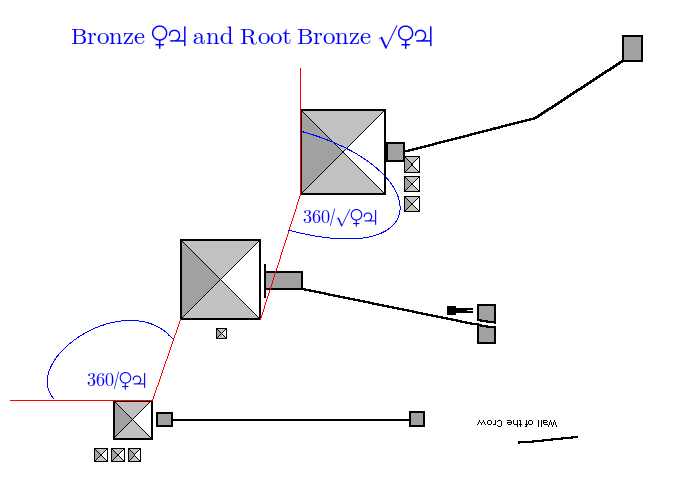 Draw a line between the Khefren apex and the turning of small way to the Khufu! It will be the 21 of June , the northern line of the morning Sun!